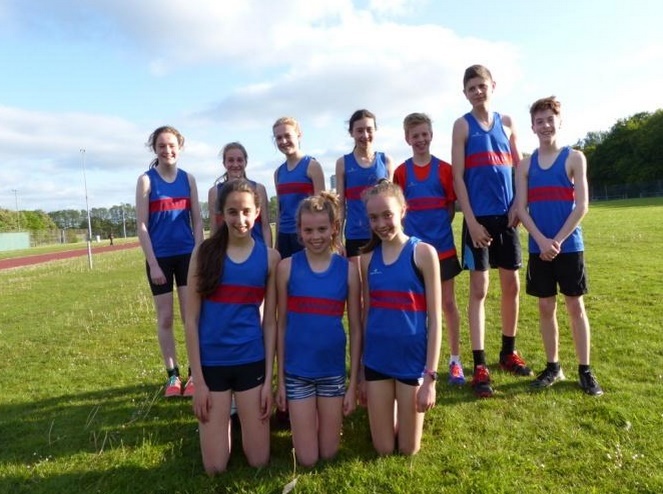 Manchester Harriers juniors enjoyed a fantastic weekend at the Greater Manchester Championships at Longford Park on the weekend of 23rd May. Many of the athletes secured personal best performances with five athletes winning medals. Georgia Fazakerley had a great run, finishing 4th in the 1200m in a new PB of 4.05.78. Katie Moss also ran a good PB in the 800m finishing in 2.45.11. 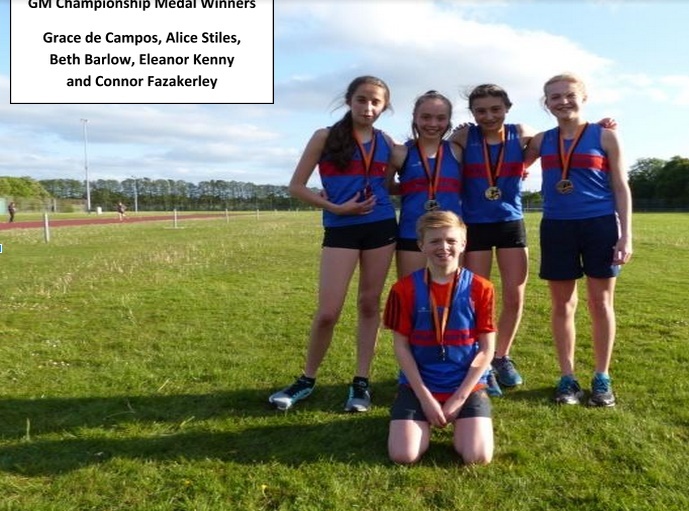 Alice Stiles was the start performer in the under 15s, winning the 1500m title in 4.55 and securing the silver medal in the 800m in a new PB of 2.19.08. She also finished 2nd in the high jump with a height of 1m 40cm. Eleanor Kenny ran brilliantly in the 1500m in her first club race of the season claiming the silver medal in a new PB of 4.58.51. Grace de Campos won the bronze medal in the 800 metres in a PB of 2.23.09 as well as running a PB in the 1500m the following day breaking 5 minutes for the first time. Emily Hughes had a superb weekend running big PBs in both the 800m, running 2.23.33 when finishing 4th, and the 1500m when 5th. Beth Smyth also ran PBs in both events running 2.23.74 in the 800 metres. Beth Barlow had a good weekend retaining her 800m and 1500m titles. This was a great performance given that Beth is returning from injury and is not yet fully fit. Her performances bode well for the rest of the season. In the boys, Connor Fazakerley was the star performer running PBs in the under 15s 800m and the 1500m. After finishing 4th in the 800m in 2.20.78, Connor ran superbly in the 1500m claiming the silver medal in the 1500m in a big PB of 4.36.76. In the under 17s 1500m, Matty Fox ran a seasons best 4.36.64 in coming 6th with Ben Skertchly running a PB of 4.38.96 in the same race. Matty followed up the following day with a PB of 2.12.80 in a fast 800m when finishing 5th. A great weekend for the club and this group of athletes who have again performed superbly.